After sitting through God's wrath against the White Star Line and A Funny Thing's feeble foray into science, the viewer is finally introduced to the videotape that Mr. Sibrel claims clinches the question. Except the viewer never really gets to see it. Sibrel claims he has an hour's worth of behind-the-scenes NASA video, and the narrator talks at length about the video, but this key evidence -- which the film says "cannot be misconstrued" -- is doled out in little bits and pieces, practically guaranteeing that the viewer will misconstrue it. Nor is it true what Sibrel says about A Funny Thing being the only source of the footage. Mark Gray has published it -- complete and unedited -- in his remarkable must-have DVD series on Apollo 11 available from Spacecraft Films. 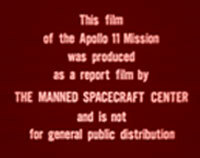 Washington University professor Larry Haskin also published it in his VHS versions of the Apollo videotapes. There you can see that the astronauts are not talking about how to fake the footage, as Mr. Sibrel claims, but simply learning to use an experimental color television camera that was a late addition to their mission. Fig. 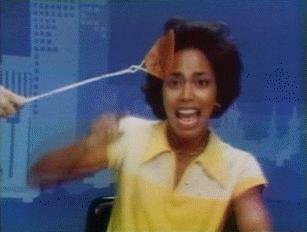 1 -A stagehand swats a fly on the head of KTUL (Tulsa, Okla.) anchor Phyllis Watson during a commercial break. Only a few words of the original astronaut dialogue appear in A Funny Thing. Since the dialogue doesn't seem very compatible with Mr. Sibrel's interpretation of what is going on, we suspect it has been omitted to keep the viewer from forming his own impression. Mr. Sibrel argues that the astronauts were figuring out how to position the camera in order to fake the image of a distant earth. Yes, the astronauts were figuring out how best to position the camera, but nothing they say or do leads us to believe they were trying to fake something. Camera placement is an important issue in legitimate videography too, as Sibrel obviously knows. As a former news cameraman, Bart Sibrel should know exactly the kinds of behind-the-scenes discussions among newscasters that nevertheless get captured on tape, and even at times, inadvertently broadcast (Fig. 1). The astronauts were preparing for a live telecast for which they hadn't had time to practice. Is this any different than a news reporter testing her uplink back to the studio by telling a joke before "going live"? And she experiments with her cameraman to find the best composition for the shot -- perhaps with a courthouse in the background, or an accident scene -- prior to beginning the formal report. None of this is evidence that any of what the reporter is about to describe has been staged. Here's what really happened on the way to the moon. The crew needed practice with the camera. While the viewfinder on the camera was sufficient for basic framing, the exposure adjustments for the best picture could only be evaluated by the ground tracking stations, who could see the picture on their large color monitors. Now a color television signal requires a lot of bandwidth, and to transmit it from the ground stations back to Mission Control required periodically adding a leased high-capacity microwave link to the tracking network. Since this special link was needed only for telecasts and not for normal voice or telemetry, it was not in place at all times -- it had to be scheduled. Specifically, it was not set up when the astronauts were practicing with the camera. But it would be set up later when the astronauts "went live". There was a secondary, private conversation in which someone prompts the astronauts. The CAPCOM in Houston could hear and talk to the astronauts, but he could not see the picture they were transmitting. The engineers at Goldstone could see the picture and hear the astronauts, but in general could not talk to them. Goldstone was recording the picture on their local videotape recorder as they received it from the spacecraft over the large radio telescope antenna. They would transmit the video to Houston later, when the microwave link was scheduled. Bill Wood was on duty at Goldstone that day and gave Clavius a description of what we see and hear in the downlink video. 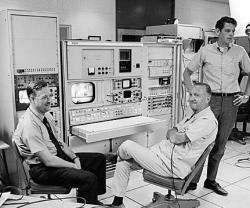 The "secret prompter" may have been engineer Bill Sheridan manning the television console at Goldstone. He is giving the CAPCOM feedback on what he can see on his monitor and suggesting how the picture might be improved. The CAPCOM then relays Sheridan's suggestions to the crew. Mr. Sibrel never lets the viewer hear this part of the conversation. The only thing the viewer hears purporting to be off-camera prompting is a garbled half-syllable, which the narration infallibly declares to be the word "talk" -- supposedly instructing the astronauts to begin responding to the CAPCOM's question. "If you listen to a lot of CSM downlink audio you will hear occasional garbled conversations that the astronauts had using the normal intercom circuit," says Wood. The astronauts' headsets served not only for the radio link to Earth but also for their local intercom communications. The switches isolating one of those circuits from the other would sometimes "leak", inadvertently transmitting a weak and distorted cabin conversation to Earth. The garble Sibrel says is a command from the ground is an example of that leakage. It's not a hidden prompter or even Bill Sheridan. It's a member of the flight crew talking to his crewmate, with a portion of that signal leaking through the switch and being transmitted in distorted form to Earth. The CAPCOM tells the astronauts that they're going to synchronize something "on the playback." Clearly this shows that the television footage was transmitted from the spaceship, edited and sanitized, and then played for the public as a "live" telecast. Mission Control had arranged for Goldstone to tape the camera tests and play them back over the microwave link to Houston when the link became available. But in order to have the benefit of both the visual image and the astronaut's comments, they wanted to have the crew narrate what they saw and what they were doing. This would be combined in Houston and used to train later crews, and to evaluate Apollo 11's performance in the telecasts. The "playback" in this statement means simply the transmission from Goldstone to Houston for review. Nothing in the dialogue states that the tape being made at Goldstone was to be edited and passed off as a live broadcast; that's just Sibrel's interpretation. A Funny Thing offers that interpretation as the only possibility, instead of letting the viewer listen to the conversation on his own and draw his own conclusion. We received the tape from NASA by mistake. That is his guess. Mr. Sibrel overreacts to the disclaimer at the beginning and assumes it was something he shouldn't have seen, therefore the "only" reason he could have received it was by mistake. It's all very tidy, and all very circular. NASA gives this footage out to anyone who wants to see it. Mark Gray got it with no problem. Larry Haskin got it with no problem. These people were up front about their intent to distribute the material to the public. Sibrel is no different. He asked for whatever footage NASA had available for Apollo and got this tape just like every other researcher did who made similar inquiries. But the film was prominently labeled not to be shown to the public. That does not make it a "secret" film nor something he was not entitled to see. The preface says it's a "report film" and that it is "not for general public distribution" (Fig. 2). A report film is one made by one NASA office or group to communicate visual information in the same way a memorandum is written to communicate textual information. Because NASA also makes films for the general public, it is prudent to identify the intent of some films lest an embarrassing (but perfectly innocent) misunderstanding ensue. Films intended for the general public may abstract away important details, while internal report films instead may focus on specific issues that don't interest the public. The issue at hand is whether the title here merely creates an expression of intended usage, or instead imposes a strict restriction against distribution outside the agency. There are plenty of examples of restricted access in the Apollo record that we can use for comparison. Some Apollo material was initially classified and some (e.g., Project Chapel Bell) remains classified today. Further there was legitimate need for secrecy. From the human end there was the privacy of the crew to protect. Many of the debriefings were initially classified because they contained details about the crew's medical status. That's between NASA at the astronaut. But there were operational and technological details that had to be kept secret as well. The United States was in a race to the moon, and keeping its tools secret in order to win the race is a legitimate undertaking. And while the Saturn V may not have been intended as an ICBM, nothing would have prevented the Soviets from adapting it as one if they had obtained the detailed design and performance information. Fig. 4 -The cover of the Apollo 12 technical debriefing, a document intially classified by NASA. The warnings are explicit. 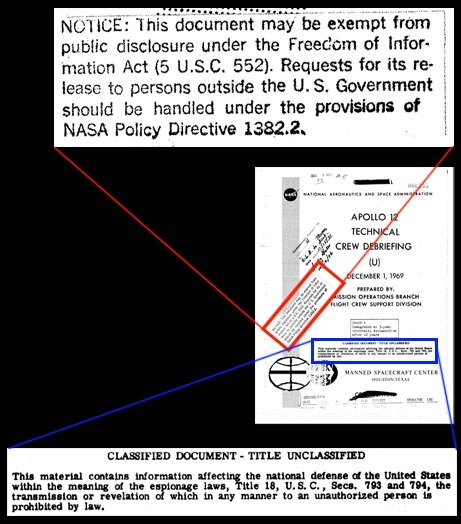 To this end many Apollo documents now available were once classified (Fig 4). And they bear today the marks and warnings of that classification, countermanded by the eventual irrelevancy of keeping the secret. These markings are far more straightforward and a great deal less ambiguous than the title frame on the "smoking gun" in A Funny Thing. Where secrecy was mandated, NASA didn't beat around the bush about it. Now before we leave this point, it's worth mentioning that NASA may have had some legitimate early desire not to have the impromptu downlink widely disseminated. Keep in mind that NASA naturally wanted to be seen as capable and well-prepared. The downlink showed a deficiency in crew training and preparedness that could have been interpreted negatively by the many critics of Apollo. Even in legitimate undertakings there are often embarrassing details. Now that the mystique of the Apollo program has largely evaporated, NASA has little face to save in that respect.